Nairn ( 8 miles away ) This peaceful seaside town boasts two 18 hole golf courses. Its amazing sandy beach (Beach Award 2008) has a playground, outdoor paddling pool, mini-golf and the Links Tea Room open in the summer. Loch Ness & Urquhart Castle ( 25 miles away ) Loch Ness is said to be home to the world-famous monster, Nessie! 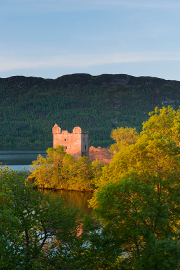 Take a trip down Loch Ness on a Jacobite Cruise or visit Urquhart Castle on the banks of the loch. Culloden Battlefield ( 4 miles away ) The Battle of Culloden (1746) was the last battle to be fought on mainland Britain. Enjoy a walk round the heather clad site or visit the newly re-vamped interpretive centre, gift and coffee shop. Fort George ( 4 miles away ) "Following the 1746 defeat at Culloden of Bonnie Prince Charlie, George II created the ultimate defence against further Jacobite unrest. 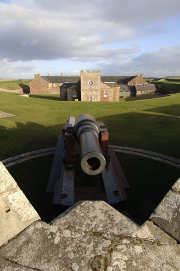 The result, Fort George, is the mightiest artillery fortification in Britain, if not Europe." Whisky Distilleries and Local Brewery Details of the malt whisky trail can be found on www.maltwhiskytrail.com. Many of the distillery’s offer tours as well as tasting of their whiskey. With over 20 golf courses within easy reach, and the new Castle Stuart links course less than a mile away, this is ideal location for a golfing holiday. Other highly acclaimed courses include Nairn and Royal Dornoch. For various walking routes around the Nairn and Inverness areas please see links below. For various cycling routes around the Nairn and Inverness areas please see links below.